Here was a parish that burst into prominence at various stages of its history. Into an area, steeped in a strong Druidic tradition,came the five saints to establish the first Christian church in the fifth century: the holy pools gaining a healing reputation as the local ‘Lourdes’. After many undistinguished centuries, the arrival of the Nonconformists, the Baptists and the railway added further impetus: all of which culminated in the Golden Age of the first half of the twentieth century, when religious, economic, cultural and social activity peaked to a buzz. 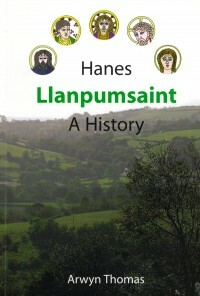 Llanpumsaint produced more than its share of famous sons and daughters: two parish-born members of parliament, two ladies of extraordinary talents and two local benefactors of note. Add to this a host of real characters, all of whom deserve to be recorded for posterity.